At times African American girls look beyond having just haircuts but love to add color to make their looks look unique. In this article I have looked round and picked favorite 5 haircuts and color for African American girls’ fall that is on track or trend. These girls below wear different color haircuts, like Blonde, Red, and Green, purple or white blonde in different styles too. Some pull it on straight hair or wavy, others pulling bangs to show that hair is rich in art thus which ever stoke that you add on short hair makes it the favorite among hair lengths. Hair with color is quite unique to view and within this category of African American girls, since this bracket look for ways possible to look hot, look that attractive and to make impact on society around them. Check how great this African American girl wearing haircut on blonde color with waves? She trimmed her hair on the sides and hair at back very short, so she reserves more length in the middle section of hair. this section of hair make this whole haircut cute because hair on sides push waves in ward and as you proceed towards the front few inches off forehead waves face backwards. the most excellent part of it lies at most front , hair is pushed towards forehead then its waved looking backwards thus complimenting your looks. This haircut looks beautiful from all angles, as in the lower part of it is pulled with tiny waves and when making it you push it equivalent to its position. This haircut is added with blonde color and relaxed. So relax comes first then color is put last for avoid bleaching. These waves are tight so you make them using curling tool. As in you pick small volumes of hair and pull waves in small sections preferably starting at the back coming forward. Remember when hair is trimmed its trimmed short entirely hair leaving out only hair at top with more length. The lower section of this hair is added with dark color so the upper part is blended with lighter one to match prompt. However few inches of forehead on both right and left sides going inward you add lighter color thus your haircut blends proportional. This haircut is worn by trendy African American girls and celebrities too. Determine your face Shape: the African American girl pulling blonde short haircut has round face shape and has fat cheeks. She pulled a high stroke when she added big silver earring. With such haircut you’re good to go for any function. This haircut too looks great on square face shape, heart face shape, long face, oval face shape and others in the queue no matter the nature of your skin tone. Which Hair product to apply? BB Hair Food Hair & Scalp Nourishment 6 OZ to condition color treated hair, to look perfect since it gets dry easily. Which styling tools apply? First and foremost you apply pair of scissors to trim your hair proportional as you check in the image on top. if you observe this image on top clearly you check that on every beginning of the right and left side hair is trimmed relatively short then as you proceed towards middle of every side you increase some length. You repeat the same process even at the back of neck. While in the middle top of hair you trim hair at medium length. In case you have natural hair, then you proceed with adding relaxer to make your hair smooth and manageable. 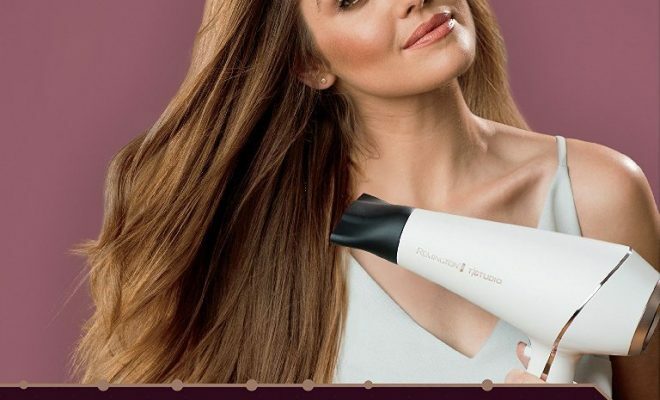 The next step that follows here is to mix up your powder with water that comes along in the pack for you to get exact color and quantizes of mixture you want to apply on to your hair. To apply color or even relax hair you put on gloves for protection. so dip small brush into the container with mixture then apply small quantities of the substance on to your hair until your entire hair is done. 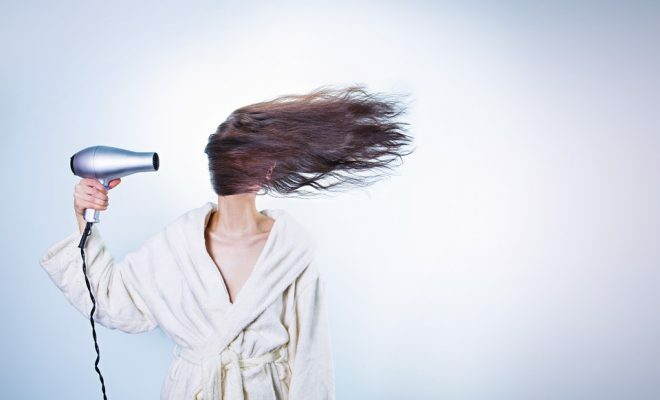 You apply the product up to hair roots but avoid painting the scalp. You leave hair for seconds and will check as if powder is getting off when you touch your hair. Next you wash off the product using cold water. 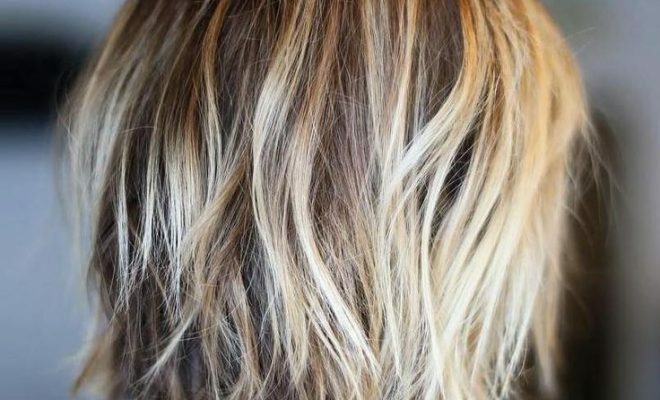 You don’t need to apply any bleaching substance because it will wash away color form your hair. Last when hair is dry apply curling tool to create waves onto your hair then apply appropriate comb to make your hair perfect. You can look adorable with short hair applied on green color. You can apply it both on your natural hair or weave. The African American girl up front thought it wise to keep hair on the middle section quite long and with volume. Because she also pull bangs that cover left hand eyes and half of her forehead. While the right part of her forehead hair is trimmed above eye brows thus giving her better looks. Hair in the middle part is pulled on loose waves from back looking forwards to make hair look stylish. While the back mid top of hair is with minimal volume more volume is reserved at front next to forehead to make hair in this position raised. so hair on the sides is trimmed on two levels, from top up to mid of both sides hair is kept with relatively more volume while the lower part is maintained with less volume to make the haircut shapely. Then at the back of neck hair is cut very short. Once hair is trimmed as required you then add green color to entire hair to make your dream a reality. Determine your face Shape: the African American girl wearing short haircut on green color which she pulled with long bangs has long face shape, to speak reality about this haircut is that it looks perfect with African American girls of long jaws while those other girls with short jaws like round faces too look cute. Only the length of hair that pulls bangs reduces to balance your face shape. 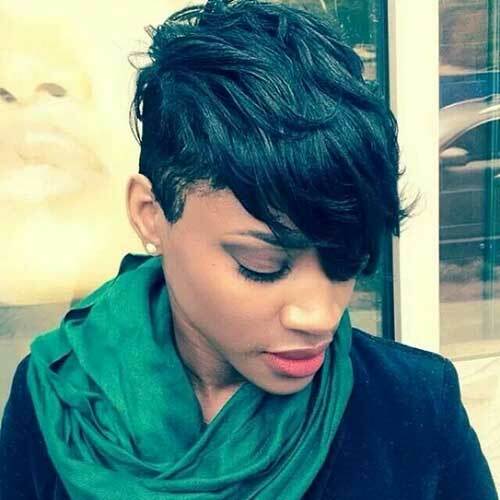 With perfect hair trim this haircut looks cute on any African American face shape. Which Hair product to apply? Apply BB HAIR FOOD HAIR & SCALP NOURISHMENT 6OZ, which works as conditioner to keep any of these hair s look good, colored hair, permed hair, pressed or damaged hair. 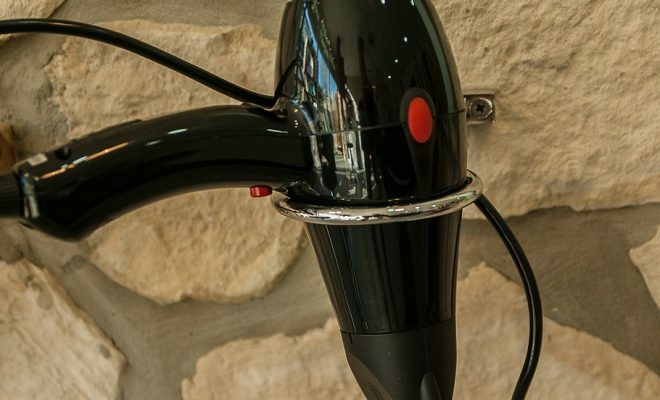 Which styling tools apply? This haircut is applied on permed hair, it’s better to add relaxer first on hair that has over one month’s growth if its originally relaxed. Unless it’s virgin and or complete natural, you will have to add relaxer that work with the texture of your hair. Then you will proceed with hair trim then wash it clean and proceed by adding rollers on to your hair. When hair is dry add hair product on scalp and few volumes on top then style hair as desired. Have you ever thought of wearing haircut and color that look great with African American girls and blonde is your number one priority? Look nowhere else because this haircut on top answers your queries. First it’s light to curry, easy to make, work round tight schedules to fit within your time line. It has great color that looks cute on every African American skin tone. The way this hair is styled puts you on high scores. First it’s trimmed on both sides short and the same length applies even at the back of neck. More volume of hairs is reserved on the middle top part of hair, while at ends you keep it with on low volume. The whole art of this haircut lies at front, as hair on the right front is trimmed above eyebrows you make it flow down, forward and left. Then the rest of hair above this point is mad towards the left to pull bangs using tong bristles to leave behind lines in between. Another issue that shouldn’t skip your mind especially on the left front as you pull bangs. Hair is pushed few inches above eyebrows. while trimming bangs you trim it some hair above left eyebrows while some hairs is pushed to cover between eyebrows then falls on the side of eyes to make your looks stunning. 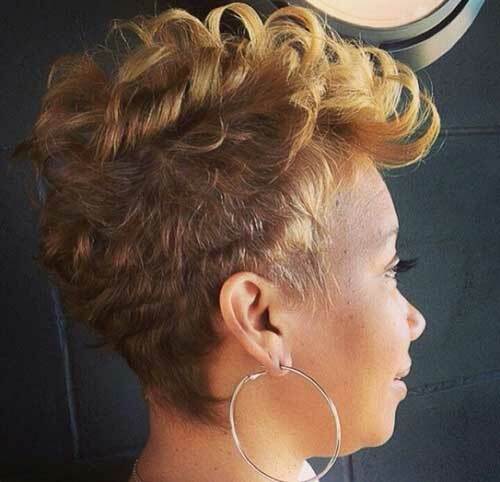 Any African American girl can wear this blonde hair cut on both natural hair and short weave on blonde. If you’re to add color on your natural hair you incur most cost while you apply the same haircut on weave you spend less. Determine your face Shape: the African American girl in the background is wearing short blonde hair cut on an oval face shape; she has long chin and long jaws. I for one recommend any girl with different face shape to go for this haircut because you won’t regret the impact. Of course it blend perfect on both your skin tone and face shape. Which Hair product to apply? On scalp apply bees wax to moisturize it and it has a pleasant smell. Then on top of hair apply the African American girl in the background is wearing short blonde hair cut on an oval face shape, she has long chin and long jaws. I for one recommend any girl with different face shape to go for this haircut because you won’t regret the impact. Of course it blend perfect on both your skin tone and face shape. Which styling tools apply? Assuming you a wearing this haircut on weave, at bottom pull cornrows on your natural hair using weaving black threads. Have hand short blonde weave to add on top of cornrows. Fix it using weaving needle and threads. Apply more pieces of weave between mid top parts of hair coming forward to make hair voluminous. Last apply pair of scissors to trim hair at tips then style hair using tong comb. For normal bristle part of this comb make hair on the sides and at back of neck then at front apply tong side on bristles to make hair look fashionable. Wahoo! 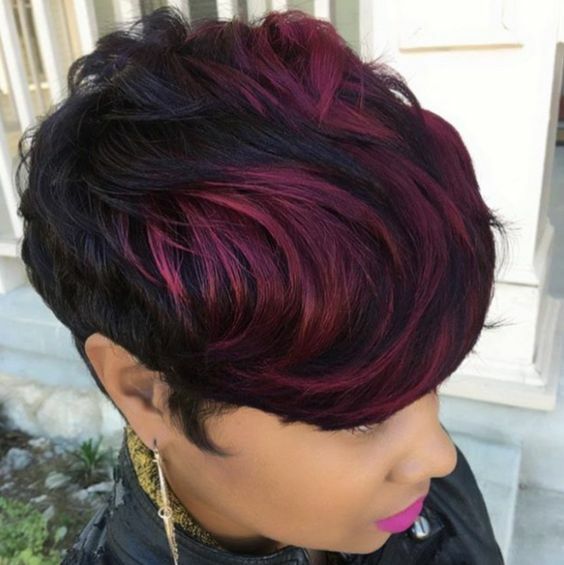 Check how short hair can take you extreme top, when you choose to wear it on short wavy weave that is thick then within you fix in purple highlights. The best part of this haircut is that is starts very short at back of neck then increase length as you come forward. From top back of neck hair is added with more volume and when you reach mid top part of hair purple highlights start mixing with few black hairs to make this haircut hot. You’re able to pull long bangs which shadows almost entire forehead that’s from the left eye and above the right eye. So before ears you leave out some hairs flowing down with tips pointing forward. While on the length cheek is entirely visible. Part of hair on the left is pushed at back of ears and some hairs up with tips looking in wards. No one ever tries this haircut go wrong but instead commands class and respect. Determine your face Shape: The African American girl up front has long face shape, so as she pushed long bangs then covered one of the sides with good color mixes what is left out next to make her girl of class, is the outfit she adds with it. However this cut has no tight principles according to any face shape. So if you add it on any face shape and fix it on appropriate lengths and shown on top regardless of your face shape you come out awesome. Which Hair product to apply? On scalp use PARNEVU CREME HAIRDRESS 6 OZ, to keep scalp evenly moisturized, and control hair loss then on top of weave add Bobos Remi Wig & Weave Detangle Spray to put off frizz, make it smooth , detangle and moisturize it. Thus you prevent weave from falling off or hydrating. Which styling tools apply? Have handy medium length weave that blends both black and purple highlights within. Have handy weaving threads to make cornrows on your natural hair. Have in place weaving needle to join weave on top of cornrows. Have hand pair of scissors to shape the haircut and last perfect comb to pull waves, bangs to make hair look perfect. 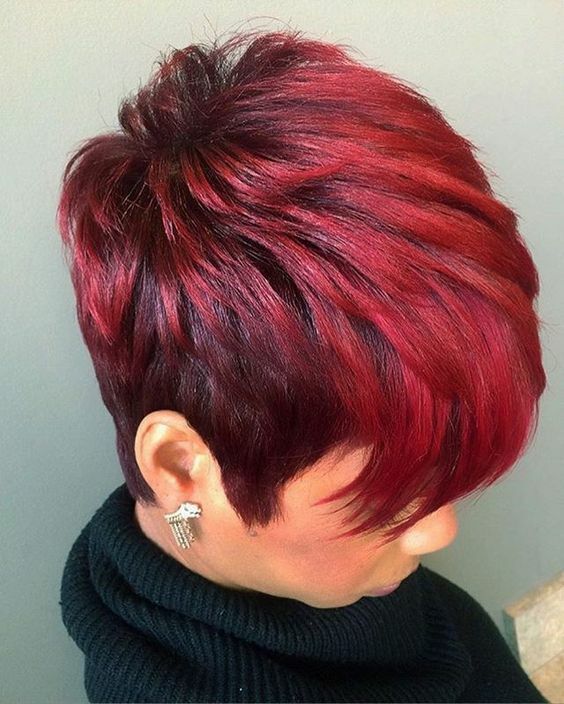 Let hair talk for you when you reason out best style haircuts with best colors. Red on its own as color is striking however you’re left with a challenge of how you style it to make it talk before any one round you can comment about it. This African American girl up front showed me talent when she wore short red haircut that she pulled with bit is waves that start in the middle top of hair. At start waves look all directions as they come down up to mid way this haircut. so more talent is displayed when long waves are pushed forwards from this midpoint and point towards the sides . However some hairs few inches from forehead coming inwards are secured with bangs and it’s directed towards the right hand side mid cheeks. It doesn’t fill whole cheeks but in style tips look backwards. as you shape hair on both sides before ears , it just stretches sharp to ear length just you emerge out of salon looking great. I guess every African American girl looks up to such looks no matter you’re wearing another color. Determine your face Shape: All round i have been particular on face shapes with different haircuts that blend perfect, but for this haircut without any doubt it looks hot on any African American girl. What matters most is the hairstylist you use to be able to fix this weave right or trim is to right lengths as the haircut demands. Which Hair product to apply? On scalp use Sulfur Butter Cream ‘n Ointment to prevent possible itching and to soothing scalp that is if you have issues of dandruff then on top of weave add Bobos Remi leave-in conditioner spray 10.15 oz: that constitutes Jojoba oil, Macadamia oil and Panthenol that penetrate deep into hair shafts to replace lost moisture. Which styling tools apply? With red short weave hand, weaving needle and threads to pull cornrows with your natural hair, pair of scissors to trim tips you are in position to make this haircut perfect. Note with professional hairstylist to fix and style haircut on standard.